Parts of freeways and highways are closed for filming on average six hours a week. Battling traffic is a reality in Southern California, frequently made worse by accidents and construction. But sometimes, drivers sit in traffic from film crews shooting movies and YouTube videos. Hollywood shuts down parts of Southern California freeways about twice a month — sometimes on busy stretches like the 105 Freeway toward Los Angeles International Airport. But how is that filming benefiting drivers? In a city known for traffic difficulties, finding the right route has become a punchline. "Get back on San Vicente, take it to the 10, switch over to the 405 north, and it will dump you out on Mulholland, where you belong," a character in the Saturday Night Live skit "The Californians" says, rather than asking him to simply leave. Another SNL cast member responds, "At this time of day? It’s gonna be jammed!" But most Angelenos never accounted for traffic delays due to the entertainment industry itself. Films including "San Andreas," "Walk of Shame" and "Taken 3" have all shut down parts of L.A. freeways in recent years. Shawn Lewis of Newport Beach regularly takes the 73 — a toll route near his home that leads him to the 5 and 405 freeways. "The traffic here is already pretty out of control," Lewis said. But Lewis found himself waiting on a film crew when "The Hangover Part III" shot one of its opening scenes on the very same 73. "I just saw all the production trucks, the cameras, the lights," Lewis said. "You could see a trailer driving along with a crane camera and filming." Several videos on YouTube show the freeway closure, complete with the sedan car actor Zach Galifianakis drives while pulling an empty trailer behind him — a placeholder for a CGI giraffe in the final scene. An SUV equipped with a crane camera captures the action from the front and side. Reporter Jenna Susko sat down to interview Caltrans’ Roger San Juan, who reviews hundreds of film applications every year. Susko: "It says on the website that you do not close the same section two weekends in a row." Are Your Car Insurance Rates Too High? San Juan: “We try not to." Susko: "But there are exceptions?" San Juan: "There are exceptions." San Juan said those exceptions are generally "big movies, because sometimes, the shot takes longer than one day." Interstate 710 was shut down two weekends in a row last year to film "Taken 3," starring Liam Neeson. Caltrans said that’s partly because the crew had to make sure stunts — including jumping a car over the freeway median — didn’t damage the freeway. The 710 was shut down again so Elizabeth Banks could get across the freeway for a scene in "Walk of Shame," which filmed over Super Bowl weekend in 2013. And the 110 offramps closed for this summer’s blockbuster earthquake flick "San Andreas," starring Dwayne Johnson and Paul Giamatti. In fact, records from the Calfornia Film Commission show some part of a freeway or highway in Los Angeles county is closed for at least six hours a week. But traffic isn’t halted just for the big Hollywood films. 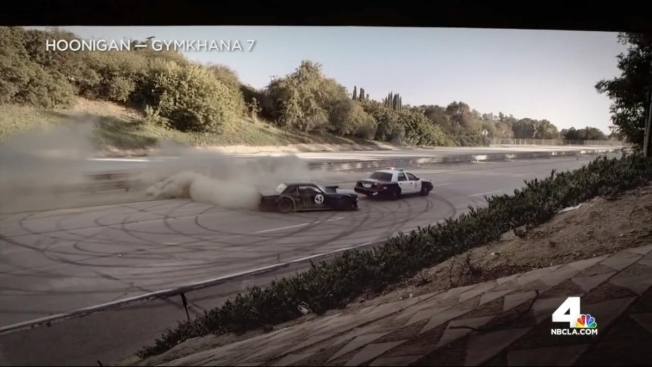 Stunt driving viral video series Gymkhana 7 shredded rubber and spun donuts, including on L.A.'s 710 freeway. State officials shut down a section of the 110 and 105 on the way to LAX so the filmmakers could shoot the scenes, which have accumulated more than 30 million views on YouTube. Brian Scotto is creative director for Hoonigan, which produced the video — the seventh in a series of high-octane clips featuring stunt driver Ken Block. "Most of the comments were, 'Oh, that explains why the traffic was backed up on the 710 that day,'" Scotto told NBC4 by video chat. One crew member even snapped a picture doing a handstand on the empty freeway and posted to Instagram, writing, "…drivers were so mad” and “#sorrynotsorry." Scotto was also involved in Gymkhana 5, when state officials shut down the Bay Bridge for the filmmakers. "Hollywood has paved the way for us to be able to get this access for movies," Scotto said. "So we figured, 'Hey, can we do this for a viral video.'" Professor Michael Cassidy at the University of California at Berkeley is an expert in traffic behavior and patterns. "One could certainly estimate the advantages of closing freeways or roadways periodically to allow for the filming of a feature movie, but [one] should in fact counterbalance that with the lost time people spend behind the wheel in congestion," he said. His team examined the data for films shot on L.A. freeways and highways, like the offramp closures in downtown L.A. over a weekend for the film "San Andreas." Factoring in wait times and average salaries, Cassidy and his team estimated the cost to society. "About $100,000 total economic impact from the closure of the 110, when they closed Fourth and Sixth street ramps," said Josh Seeherman, a postdoctoral researcher who works with Cassidy. Other states like Georgia charge production companies site fees to close freeways to make up for the inconvenience to drivers but California doesn’t — however, it does charge monitor fees and permit processing fees. "I feel we should do what we can to keep filming in California," San Juan said. "Why not charge a fee?" Susko said. "Because," San Juan said before pausing. "That’s a good question, I really don’t know." Officials at Caltrans later told us this acts as an incentive to make California a "film friendly" place for entertainment production. "We pay for the roads, and we pay to drive on them," Lewis told NBC4. But Scotto, of the high-octane videos like Gymkhana 7, said the traffic trade-off is worth it. "If we weren’t able to close these roads, there wouldn’t be these great movies to watch," he said. So just how easy is it to get a permit? NBC4 applied for one to shut down the 4th Street freeway offramp for tonight’s 11 p.m. newscast, and were told it would be possible. NBC4 did not pursue the permit any further. Caltrans also says it doesn’t allow major freeways — like the 5 and 101 — to shut down for filming. The California Film Commission, which coordinates filming permits on freeways and highways, declined our repeated requests for an interview.